I'm not quite sure how to begin this one. I stayed home from the City Council meeting last night, nursing a couple of physical ailments, figuring I'd be more comfortable at home than in the council chambers. As it turned out, if I'd been in the council chambers the lovely Officer Meng might have had to haul me out in handcuffs! I'm glad I stayed home, but I'm angry about the proceedings, nonetheless. The meeting started nicely enough, with some wonderful presentations, including a well-deserved recognition of former mayor Jack Hammett with the presentation of the Mayor's Award. That was great, but had a downside, too. Unfortunately, our increasingly-irrelevant Assemblyman, Allan Mansoor, returned to the council chambers to give Hammett a resolution from the State of California. He probably has plenty of time on his hands these days, since he's not making much of an impact in Sacramento. "A SYMPTOM OF THE DYSFUNCTION OF THIS COUNCIL"
"The conduct of the last City Council meeting was a disgrace. The agenda was manipulated so the concerned citizens would not be heard. Many, including me, had to leave before the opportunity for public comments. And even the Consent Calendar was delayed. This Consent Calendar had a couple items which, it was very clear, would arouse comments. The extension of temporary outside consultants with very generous pay, which is wrong, a drain on the city and a contradiction on your claim that the city is short of money." "This manipulation of the meeting is a symptom of the dysfunction of this council. When what you're doing is good and honorable, when your public actions reflect the ethical standards you have learned, when you as leaders act responsibly and responsively to the voters, there is no need to stifle dissent. In fact, there wouldn't be the dissent that you've been facing for the past few months." "Your critics, whether they express themselves in writing, by speaking, with lawn signs or by singing, are widespread and diverse. Your efforts to pigeon-hole us as a specific group are wrong. We are staunch Republicans, Democrats and Independents. We come from all walks of life - including the professions, self-employed business leaders and civic leaders. We live in neighborhoods all over the city. In fact, one tiny silver lining for me in the dark cloud that you've cast over Costa Mesa has been the opportunity to meet so many intelligent, well-spoken, public-spirited members of the community." "Your opponents are not out for themselves, not out for political or personal gain, not even out, as has been the case with me in the past, for some particular need for their own neighborhood. The problems you have created are not narrow neighborhood problems. You're endangering the health, both literally and figuratively, of the whole city. You even managed to anger a well-respected law enforcement official whom you had recently hired to the point he wrote a scathing letter of criticism and resigned." "How much more, and what else do reasonable people have to do, to convince you that change is needed? I beseech you to stop, think, analyze and understand that you're throwing good money after bad in order to make a narrow political point. The residents of this city want only responsible and responsive government. Please, wake up! You all, in your hearts, can do better and end this nightmare that you've created." Of course, the council ignored that passionate plea and shrugged off other critics, as well, but not without some confrontational retorts. She was followed by Terry Koken, who was quite obviously not in a singing mood last night. He used his three minutes to passionately scold Monahan for his heavy-handedness at the earlier meeting, citing the Constitution and his right of free speech. 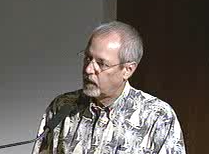 I'll include a video clip of his presentation when it becomes available - it's worth seeing. The worst part of the evening, in my view, was the reaction by Mayor Pro Tem Jim Righeimer and councilman Steve Mensinger during the discussion of the request from Costa Mesa Pop Warner Football for what Wendy Leece described as an improper use of public money. During his rant he reac hed a point where he, once again, asked the question, "What have we gotten to in this community? We've got a labor union hiring a gun-toting private investigator questioning student athletes about their signs." He looked directly at Nenedal again and questioned her about it. When Leece tried to make a point of order Monahan said Righeimer had the floor. Righeimer then, with an angry attitude, said, "Point of order? I'll give you point of order! ", then continued with his harangue, which included an oblique accusation that Leece's vote on the employee contracts last fall had been "bought" by a $26,000 contribution the day before the vote. An angry Leece challenged his allegation, but received no response - the damage had been done. Mensinger took the baton and kept running - straight at Nenadal. And , when he was not sniping at Leece, accusing her of not knowing the issue or accusing her of voting for programs that somehow provided her with money, he was ripping speakers for the audacity they showed in criticizing him. He went so far as to quantify his contributions - which he told the audience was over a half-million dollars worth of time and energy - as he personally saved football in Costa Mesa. His ego is so huge I was afraid it might explode and severely injure members of the audience. I wondered on this site before about the propriety of him even being in the auditorium during this debate, since he is the most recent past president of Pop Warner, much less leading the advocacy for its request. During the discussion he described his role as past president as "mentoring the current president". Well, isn't that just great! Speaker Perry Valantine posed the question and contract City Attorney Tom Duarte said Mensinger had no conflict. OK, "no conflict" is one thing, but being the primary spokesman for the organization - Mensinger carried the ball almost exclusively and kept referring to "we" when talking about Pop Warner football - is something else all together. The more he talked the angrier he got. And the angrier he got the more he made backhanded comments directed against Leece. The guy really is a no-class thug and bully. I came away from watching this meeting more disturbed than any of the other contentious meeting this year - and there have been many, many meetings since Ja nuary that were very frustrating. This one, though, demonstrated the "in your face" attitude Righeimer and Mensinger have with the public. I've said many times that they don't like to be told "No"... well, tonight demonstrated that better than any other meeting I've seen. They're giving us that old "There's a new sheriff in town" routine. They, along with the part time, part time councilman, Eric Bever, have decided to begin blaming previous councils and employees - including former City Manager Allan Roeder - for every ill in the city. That behavior is disgraceful and completely inappropriate. These men are quite obviously not happy about the rules of municipal governance that constrain them. I fully expect them to brush those rules aside as they continue their slash and burn tactics in our city. And, finally, I was very concerned about Mensinger's "I'm not going to forget about it" comment when referring to the accusations and investigation of the "student athletes" in the missing signs situation. A couple times last night he tried to use the words "vehement, venom and vitriol", but got them tangled up. He forgot one "v" word - vindictive. That's what he was showing to us last night, leaving us with the implied threat of retaliation. He seemed so angry about the issue that I had the impression last night that he would sweep every municipal employee out the door today if he could find a way to do it legally. If the Costa Mesa employees thought it was bad so far, I'm afraid that, as the old saying goes, "They ain't seen nothin' yet". WHAT ABOUT THAT "STREET SWEEPING" RUMOR? 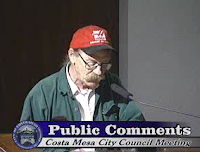 Oh, yes.. During Public Comments Valantine asked about the rumor heard yesterday that the city is in negotiations with the Costa Mesa Sanitary District about the District taking over the street sweeping operations for the City. We know there is an RFP in the works with a distribution date of tomorrow. However, we, too, have heard the rumor that included very specific information about conversations between the City and the Sanitary District yesterday. We find ourselves wondering if this may not be an end-run around the court ordered injunction. The City may continue to pursue outsourcing to other government entities - like the Sanitary District. However, the Sanitary District does not have any equipment to sweep our streets and would very likely have to outsource the job itself, maybe to their current trash company, CR&R. Does that violate the spirit of the injunction, since it would be a private company doing the job as a contractor? That sounds like a question for Judge Barbara Tam Nomoto Schumann. It also sounds like it would be more expensive than the City contracting out that job to another entity directly since the District would be a middle man and would certainly expect a little profit for their trouble. The next meeting of this council will be their Study Session on Tuesday, August 9th. The agenda for that meeting will be distributed in a couple days. After that there is no meeting scheduled until the day after the Labor Day holiday. It's a good time for a little vacation but there's plenty of time for mischief by those in charge of my city, so we'll just keep on watching and reporting. In a few weeks Housing and Community Development (sans Dan Baker who is now the Boy Friday for the City Manager)will be shoved to the 2nd floor. Mensinger and Riggy have ordered new keys, new furniture and now are in the process of having the enire 5th floor on shut-down as tight as a prison. Anyone admitted to the 5th floor will have to be either a consultant or paid bully to speak with or engage with the City Manager's office or City Council. What secret back-door deals will be made? How many "employees" will be hired without going through the process mandated by the contracts because they are a friend or have a construction company who have back-door deals with members of the city council? (I.E. The Building Official) How many consultants will be hired who don't go through a police screening, reference check, or drug test as every employee of the City of Costa Mesa is required? This is not a Union vs The City Councl. This is 4 men who have an agenda to suit their own purposes. This is the Citizens vs The Council; in my humble opinion,this is a scary road these men have chosen to walk. I sincerely hope the State's Attorney General is going to press charges soon- and when that day happens justice will be served for the citizens. The city's always been a bit unclear on what constitutes conflicts of interest - looks like nothing's changed from prior regimes in that regard, other than the fact that these guys aren't even attempting to cover it up and just doing it out in the open. “Did anyone get the number of the bus last night?”… CM is asking for your help. Witness say there were at least 8 men, two elderly women and hundreds of kids ranging in ages from 8 to 18 and wearing some type of athletic gear; one witness claims to have seen what seemed to be parents of these kids. Another witness remembers seeing the two elderly women, in their 90’s, sitting up front near the driver, wearing cheerleading outfits. ALL witnesses say that everyone on the Charter Bus in question were laughing and yelling faster, faster, go faster. The driver has been described as being between 5’ and 5’1”, in his 50’s, thick, with no neck; he also had an extremely large mouth, sporting a sheepish grin. Reports say there were at least 7 pedestrians severely injured with one confirmed fatality, when the bus sped up trying to beat the yellow light, hitting everyone entering the crosswalk. Also, ALL witnesses agreed that the injured pedestrians had a green light and expected the bus driver would follow the rules and stop when the light turned red; an expectation which turned out to be a fatal mistake. It is unclear why this newly licensed driver has been allowed behind the wheel; rumors suggest the Charter Company had recently transferred this driver to get more experience. When asked about this driver, the nationally ran Charter Company refused to comment. After Terry Koken spoke last night, (and boy did he eloquently rip them a new one), I bet Monahan wished he had just sung one of his songs. Motion to stop referring to Righeimer as "Mayor Pro Tem." Monahan has ABDICATED the mayorship. 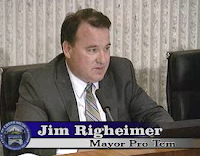 Righeimer is the De Facto Mayor of Costa Mesa. Smirkmarshal Mensinger is Vice Chancellor/Mayor Pro Tem. With his "I'll give you a Point of Order" rant, das Riggmarshal has effectively declared war on all critics and dissenters. He and the Smirkmarshal are now calling out citizens from the dais by name. Excellent meeting last night !! After months of taking it on the chin the council finally fired back. Genis and Leffler bad mouthing our city at the HB City Council meeting? Very nice, ladies. And Righeimer suggested they are doing it in Newport Beach as well. Can't wait to pull up the video of the HB council meeting and see what the other 5 council members there had to say since the loonie lefties only quoted two. So Mensinger donated to Righeimers campaign. Oh Oh moment until overshadowed by the revelation that Genis' group spent 26K on a campaign push for Leece the day before the union contract vote ! !Gotcha Sandy, you opened Pandoras box. Pop Warner revealed by Leece, through Genis of course (who reads line items about things she knows nothing of and then casts the most damaging negative light possible)spent 5K on wearables and 2K on food. Oh those pigs at the trough Board of Pop Warner. Oh wait, the wearables are for fund raising tshirts and caps sold for scholarships for the youth. And all that food is the hot dogs and chips they sell to raise monies. The Board doesn't even get a free hot dog, they buy them, it turns out. Crying wolf over and over and then being shown as complete idiots is a beautiful story line for these complainers who see a conspiracy, conflict, and/or Brown Act violation at every turn. The usual gang of public speakers spread their lies and venom month after month. It was ime to call them out and have them scale it back and expose them for what they are. Best meeting ever. He knows something and might be involved. I think he's angry because he's being investigated and questioned. Bullies don't like that. People with something to hide like it less. The bully is using all the parents and kids in the Pop Warner program as human shields. It'll be interesting to see the results of the investigation. This isn't just about "little signs"- it's about The First Amendment to the United States Constitution which prohibits suppression of free speech by AGENTS OF THE GOVERNMENT. I watched some of the meeting last night--the same old group of folks saying the same old silly stuff. More yawning. Just some rants from crazy folks with too much time on their hands. I've been enjoying this particular Council, a fresh group to get our budget house in order. They're doing a pretty darned good job! Looking forward to E-verify. Look there and who do we find? Riggmarshal and Smirkmarshal shill James Fitzpatrick. I have more respect for the homeless around Lions Park than this buffoon. And said homeless actually look and dress better than JP. Hubris lies at the center of most tragedies, and it's the overwhelming arrogance and sense of entitlement that is most disconcerting in the appalling behavior of Righeimer and Mensinger. Their band of sycophants, starting with Bever and Monahan, follows willingly behind the chest-bumping bullies. Wow, watching Costa Loca implode is just amazing. Righeimer will stop at nothing to get what he wants. He is determined to prevail. He was worked too hard to not get what he wants. He is so angry that he was pushed back the the court injunction, he is now hell bent on getting rid of employees one way or another. In his mind he has found a lophole to getting around the injunction. Have another public agency take over a city operation and have that agency contract the service with a private company. He does not care if service will be compromised or their is no cost savings. OCEA better get its act together soon to see if this is in violation of the court order. This is a much bigger deal than Pop Warner Football. Please Eric, don’t castigate me for this comment... as I feel you will. Bever wants staff to look for ANY other City, that has a rule where council must have at least two members approve ALL items submitted to be agendized; this is yet another blatant attempt from these arrogant bastards to sinecure Leece. Remember boys, each of you were voted… wait… most of you were voted onto this council to represent your constituents; one whom was not elected seems to only represent Westside jocks and megalomaniacs. To even suggest this type of restriction on a member, implies that 68.3% of CM voters’ who didn’t support a particular elected official, should not be given an opportunity to put an item on the agenda without Daddy first approving and then giving (or not) his permission, is ludicrous. Pete W, point of clarification. There are only a handful of complainers left. Yes, they say the same thing, over and over. And now a couple are taking their lunatic show on the road, and siding with the lunatics on the HB Council … they do not quote Don Hansen who is solid on the issues. Literally down to a handful. As predicted, all the big lines have gone away, and we are left with the same old people, saying the same old things. Including Geoff West. Geoof West, rather than celebrating the life and contributions of Jack Hammett, chooses an opportunity to put in a funny face of Assembly Member Mansoor. Sad, sad , sad. To take such a great opportunity, where the Parks & Rec Commission will follow up to name a park after this great resident, West cannot help himself but to disgrace this event with this blog. There is a clinical diagnosis here somewhere. It was pure entertainment to read another professional journalist, take the time to investigate West’s claims about another elected official West has a man crush on, and dissect West’s lies like a prize fighter punches. One lie dismantled after another. With cold hard researched facts. That should speak volumes about what a couple anonymous people claim to be of value in our community. I suggest we take West out with the trash. CMPD … looks like Fullerton is hiring … on a serious note, that is a tragic event, and I feel for their city. I do believe that an incident could occur here in our city. We already have examples of planting of evidence, planting of tracking devices on a woman’s car, and several other questionable events. I hope that the new Chief will reign in some of the bad apples and restore greatness to the organization. And do so in time for the next election. Maybe Costa Mesa should consider such a panel structure now, to handle the little stuff, before we could be forced to follow Fullerton. Just a thought. Righeimer's commentary last night was very eloquent and to the point. In fact, it could not possibly have been better. I admire his patience, and his courage under fire, to say the least. Jim said what desperately needed to be said, and he was speaking for all the residents who did not attend the meeting. They far outnumber those who do. We don't attend because we are happy with the council's decisions (minus Leece of course). Leece is obviously nothing more than a union puppet. Her comments and actions at the meetings are strictly self serving. 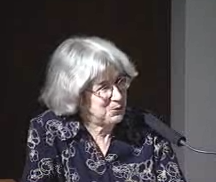 With the exception of Tom Pollock and Martin Millard, most of the speakers were simpletons and cuckoos. They need to stay home because they have absolutely nothing to say. Costa Mesa PD had a case worse than Fullerton's back in the eighties. Multiple CM cops shot and killed a young mentally ill homeowner inside his home on Presidio and did so from his front yard. He had broken no laws. I don't recall any cops getting fired in that case. Cities don't like to lose lawsuits and firing those cops would have been tanamount to admitting guilt. Those same CM cops are probably among those who recently retired with big, fat, pensions. Yeah, Millard is certainly not a simpleton. A virulent racist perhaps, but not a simpleton. I have yet to see the Righeimer patience on display, though. Lest anyone forget the four men who were so rude from the dias are public officials. The council chambers is not the playground to bully your opponents. They were elected to "serve"all not just their select friends or other GOP comrades. It's ironic in a "so-called" budget crisis thousands is being spent to have a brand new 5th floor lobby costing employee time to coordinate. My tax money is okay for the city council to refurnish the offices for themselves (since they are kicking HCD out) - this is public information. Request copies of the invoices and proof for yourselve all the naysayers. Thousands of dollars are being funneled to cohorts in the design business. Again, the proof is in the paper trail. Having the excuse of no money in the budget doesn't work anymore.. The city council have cried wolf while buying themselves a bundle!! Locks changed, furniture ordered, what's next? A built in Bar for Monahan???? Das Riggmarshal was the Belle of the Ball last night. All dissidents are dumb and simple. Only the Annointed One and Smirkmarshal Mensinger know what is best. G. West and W. Leece are bad people who work for the unions. When Riggy when off in his best Truman Capote voice last night, he made Napoleon look like Lamar Odom. The respective rants of Riggy and Menssy tell us they are running scared. Mike1, if Martin Millard is a racist, then so am I. I don't like white people. You see, it takes two to tango in this world of ours. Balance of all kind exists in all levels of nature. People need to get off of their racist kick. Very clever, but your first line leaped way, way beyond the line. Sorry. The Koken piece is on the next blog. ..."He looked directly at Helen Nenadal, the President of the Costa Mesa City Employee's Association who had spoken earlier and, shaking his pen at her, said, " Ms. Nenadal, we have enough money to run our city, we just can't afford the cost of your employees." He then launched into a tirade about vacation days, sick pay and on and on." Who knew all the general employees belong to Helen. I thought they were employees of the City of Costa Mesa. The City approved all the contracts. All the association can do is recommend. The City has all the power. Sorry Righeimer that you were not on the City Council when these contracts were approved. They are contracts however and can be renegotiated when they expire. Life is not always fair Mr. Righeimer, but an honest business man would honor contracts even if he does not agree with them. Go start your own company if you want to do things your way. I am frightened how much money the City Council is spending on the refurbishing of the 5th floor lobby. I walked into the 5th floor and saw 2 chairs; the entire area has been cleared for the new furniture. I was also told it was in access of $3K. I have a document request on file and lets hope they honor it. How in the heck can the City Council cry poor left and right but spend money like school girl at the mall??? Tex (or Mr. Millard) - good for you. I try not to hate any particular race, white, black, yellow, brown, whatever - it's the person underneath the skin. But whatever floats your boat. Seeing as how I'm white, I guess you wouldn't like me too much, and based on the comment, the feeling would probably be mutual. Talking Trash Man – let’s take your writings and dissect them; separating fact from fiction. Unlike you, those so called “lunatics”, study the issues; do research when necessary; form an educated opinion and then present that opinion in person, observing their first amendment right to do so. You on the other hand, seek out others opinions trusting they are fact based; hide in the shadows using multiple monikers to criticize anyone who threatens your planet… now which is lunacy? Using that superior intellect you assuredly posses, have you considered the repetition is an effect, not the cause, of Council’s refusal to listen to anything but the tooting of their own horn… much like you. In regards to Geoff’s option to expound on the obvious politicizing of an event, after acknowledging the Former Mayor’s merit, is no different than your selective dribble. Because you are so enamored by your own intellect, or blinded by your own “men” crush, you have ignored once again the fact that Geoff has never alleged to be a reporter (like those at the Republic of Costa Mesa… sorry this is just too funny) and has many times admitted he only writes to what he hears, observes and that which is pasted on to him; also of things “HE” finds interesting… no more, no less. To criticize him for doing exactly what he purposed this blog to be, a place for him to write as he pleases, and to allow JACK ASSES like you, to post venomous puke, demonstrates his true moral fiber… again, unlike yourself. Wow. Martin Millard wrote tonight with at least four aliases! He must be getting desperate. Seems like since no one else supports his biased, racist, bigoted opinions, he has to supply his own support. Could be he has family members on his side and maybe a few of the Nazi's he writes about on the web, but not many more. Same drivel from a black shirted idiot....In my opinion of course. Please Help Find Jim Halaszyn - DONE! What Is Talon Up To?